On the 17th March 2019, the team at Gleddoch Hotel, Spa and Golf attended the Glasgow Marriott Hotel to celebrate a resounding success upon winning one of the most challenging categories at the event. The hotel was chosen as the Best Hotel Between 50 & 200 Rooms, beating out stiff competition from across Scotland. The awards ceremony itself hosted over 400 guests and gave out 20 different awards, all focusing on Scotland’s highly-competitive and world-renowned hospitality industry. With this success, Gleddoch Hotel, Spa and Golf is firmly established as an exceptional accommodation option in the Glasgow area and beyond. 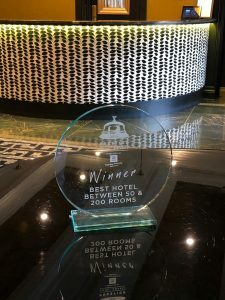 With 2019 being only the third year that the Prestige Hotel Awards have taken place, there is little history surrounding these achievements. However, this doesn’t detract from the prominence that comes with winning a national award which featured extremely fierce competition. 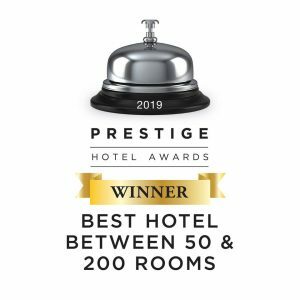 Founded by Warren Paul, a veteran of the Scottish entertainment and accommodation industry, the Prestige Hotel Awards strive to locate and celebrate the best that the Scottish hospitality industry has to offer. Each award indicates a level of quality that is recognised nationwide and in the coming years, the already substantial respect that the ceremony has garnered will only increase. Gleddoch has been a highly respected and recognised luxury hotel for a long time, even boasting royal visitors in the past. In more recent years, we have taken home plenty of other awards including success in four different categories at the Scottish Hotel Awards in January 2019. We always strive to provide the best possible service and winning awards is a great way to demonstrate that we are achieving our goal! Whatever the needs of our guests, we make sure to offer personalised advice, facilities of unrivalled quality and a relaxing environment so that every stay is as easy and enjoyable as possible. It’s this extra attention to detail and level of care that makes us an award-winning hotel. If you are interested in joining us and getting a taste of our award-winning service, we are always willing to welcome you. Our team will gladly tailor advice and suggestions to your needs, so please don’t hesitate to get in touch on 01475 540 711 or check our availability online. Gleddoch is an independently owned hotel resort, beautifully located overlooking the Clyde Estuary. Gleddoch boasts 75 bedrooms, an 18 hole championship golf course an elegant banqueting room and a luxury Imperia Spa.